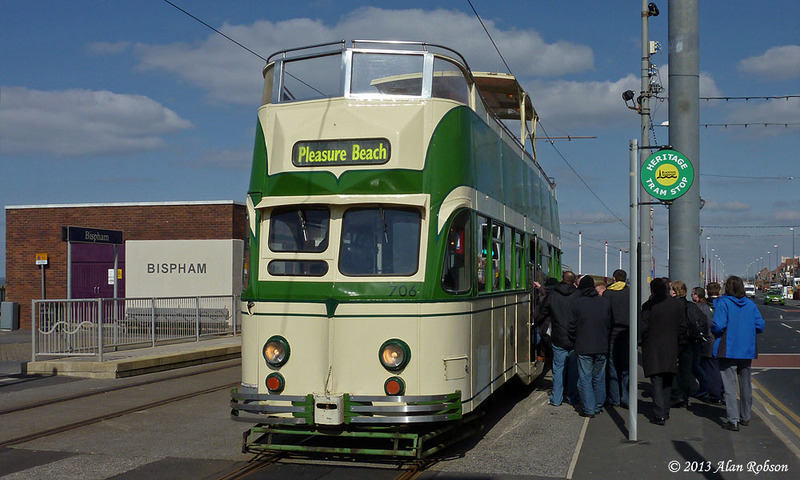 Easter Sunday saw the third day of the Heritage Tour weekend in Blackpool, with Bolton 66 leading the way with a run to Fleetwood, followed out by 706 as the other Heritage Tour car for the day. In the morning Boats 230 and 600 were rostered for specials, despite the weather being cloudy and rather cold. The Boats hadn't been in operation for very long when they were swapped for Balloon 717 and Box 40, which were much more suited to the chilly conditions. Balloon 717 managed a run through to Fleetwood on specials later on in the afternoon, and as on the previous day the weather picked up by mid-afternoon, with blue skies becoming much more evident. March 30th was another very chilly day in Blackpool and saw Standard 147 and Balloon 717 on the Heritage Tours, with Box 40 and 706 running on specials. 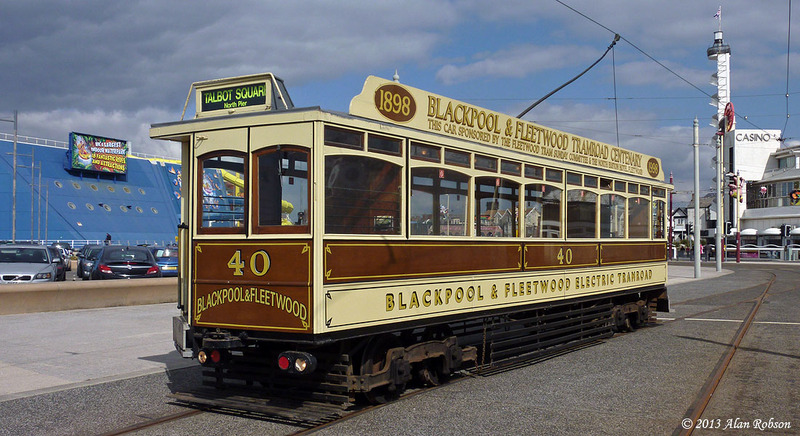 147 handled the first tour of the day, and operated through to Fleetwood as timetabled. 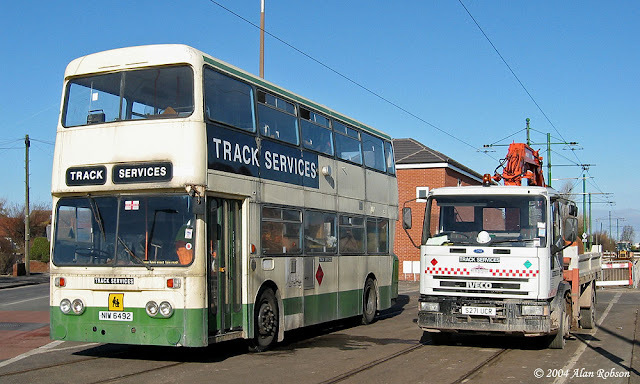 Around lunchtime 706 Princess Alice ran an extended special journey right through to Fleetwood Ferry, and on returning to Blackpool went into Rigby Road depot for a crew break. 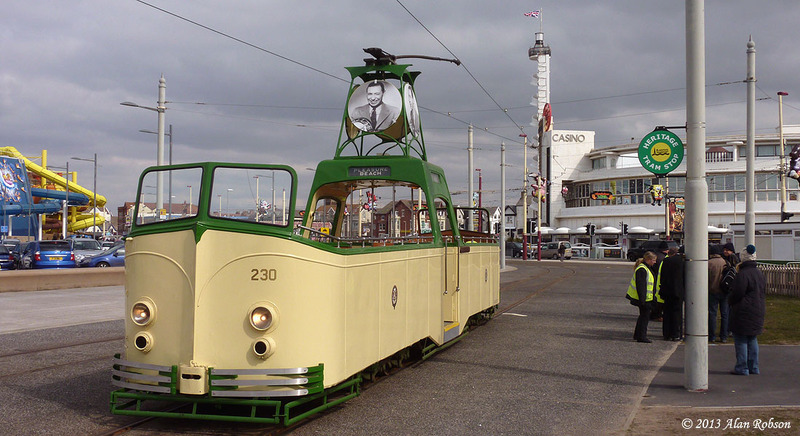 After their break the crew came out of the depot with Boat car 230, which then proceeded to operate on specials between North Pier and the Pleasure Beach. 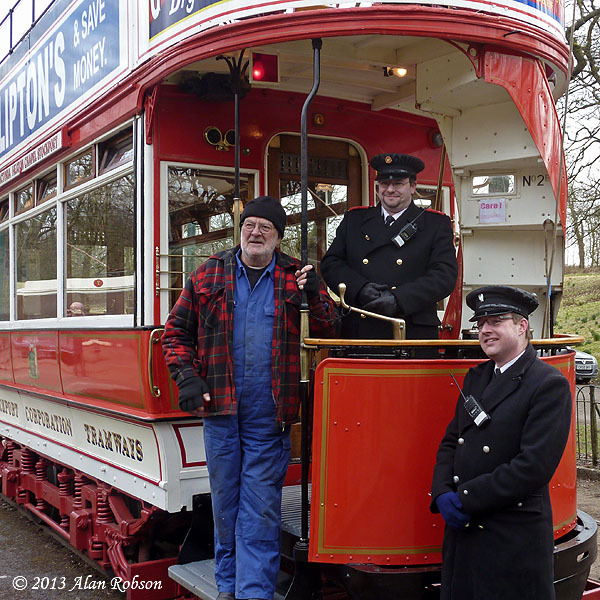 All in all another very interesting day, full marks to Bryan Lindop and the heritage crews for making it all happen. 706 Princess Alice at Fleetwood on a special, some brave souls travelled all the way from Blackpool on the top deck! Day one of the 2013 Blackpool Transport Heritage Tour season saw Box car 40 running all the way through to Fleetwood Ferry on the first journey of the day. 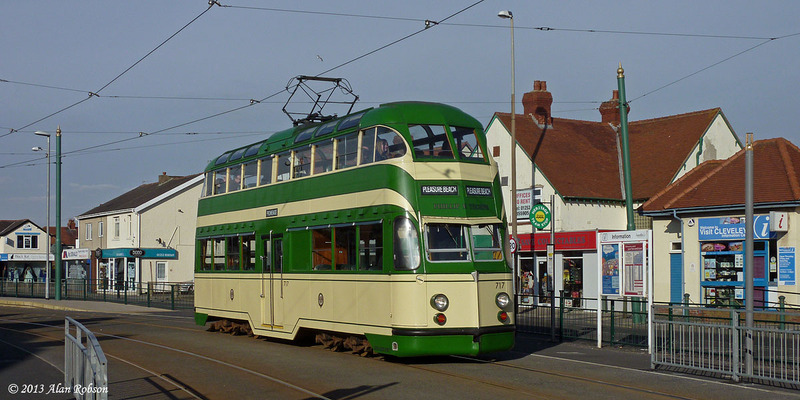 By the time that the tram had arrived at the heritage stop in Cleveleys, it was already full to capacity in the saloon, the only space available being in the rear driving vestibule. 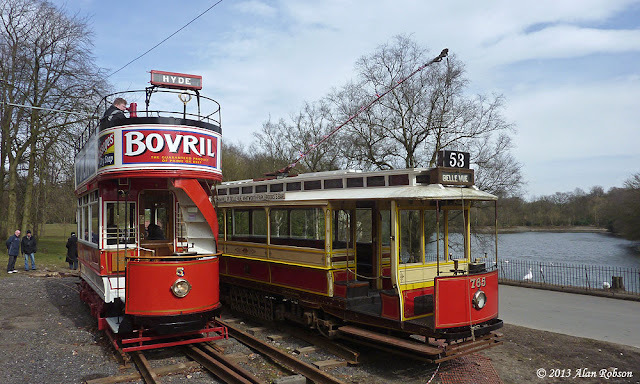 The pattern of operations during the day was Box 40 and Bolton 66 were assigned to the Heritage tour, while 706 Princess Alice and Balloon 717 operated specials between various destinations throughout the day. The day was rounded off with Bolton 66 making the full run to Fleetwood, arriving in Bold Street at 18:25, just as the light was beginning to fade. 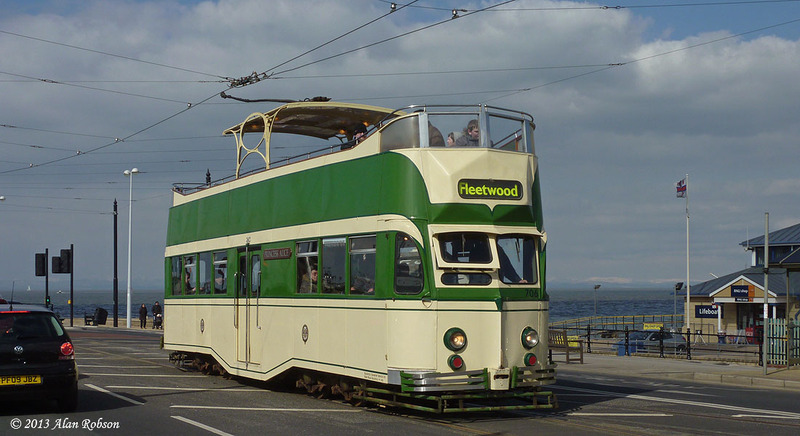 In advance of the Heritage Tours beginning again on Friday 29th March, two new set of stops have been installed in readiness for the selected journeys that are being extended through to Fleetwood Ferry. 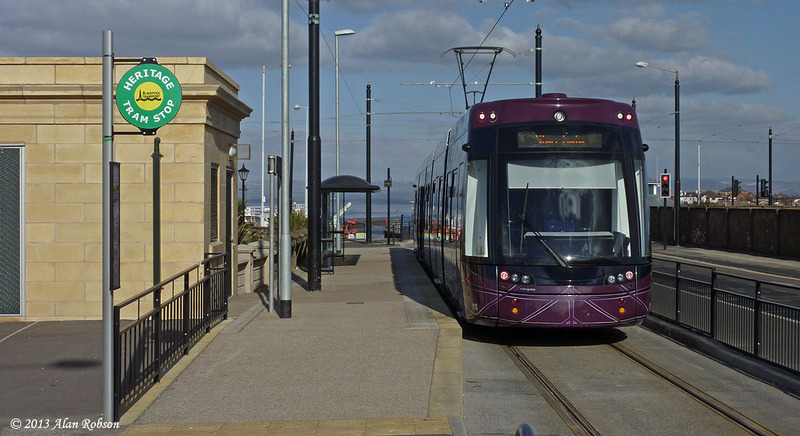 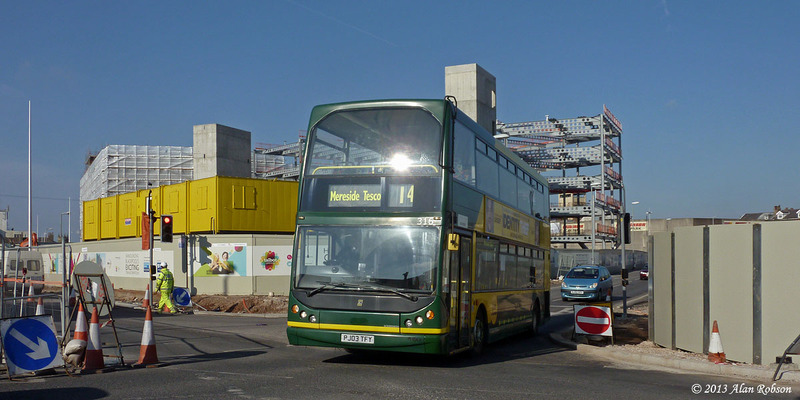 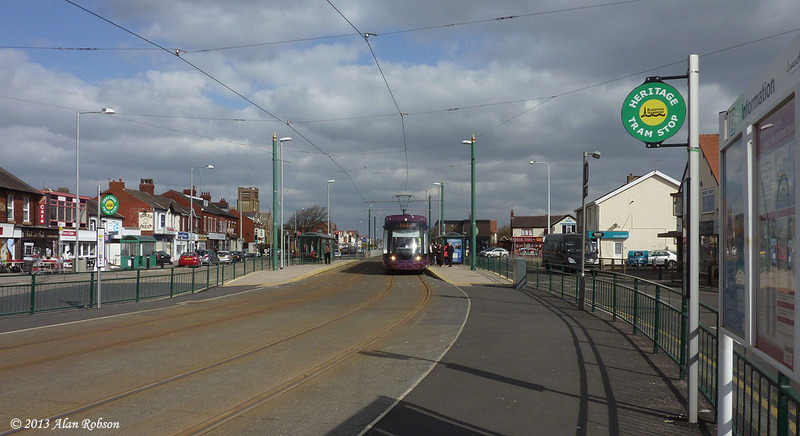 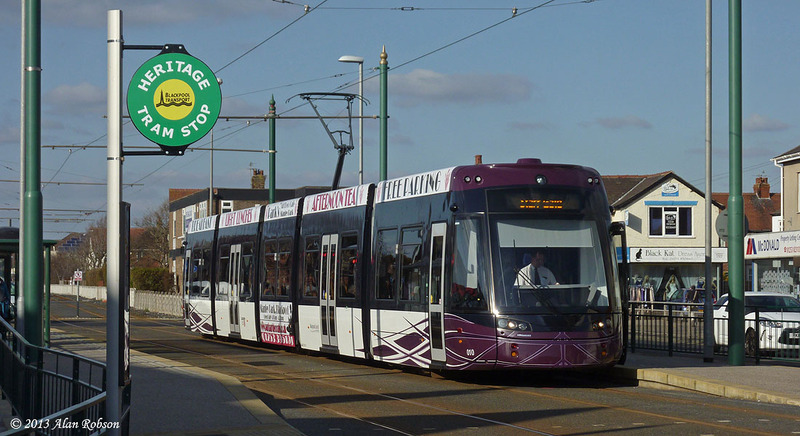 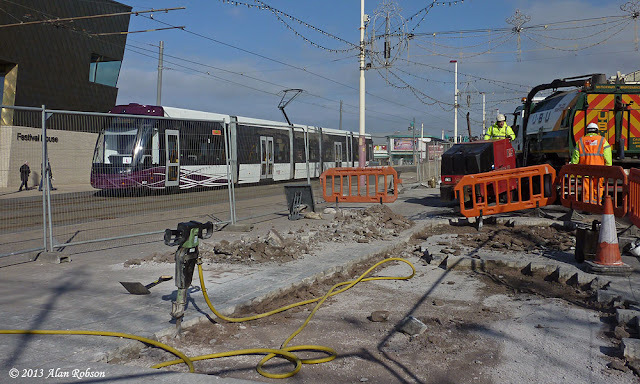 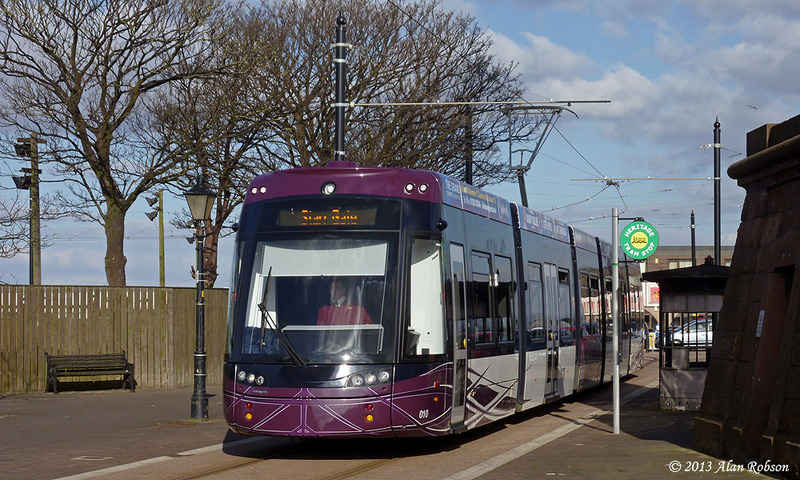 New Heritage Tram stops have been erected at Cleveleys, Bold Street (alighting only) and Pharos Street (boarding only) in Fleetwood, the stops are located at pavement level away from the platforms for the Flexity 2 trams. 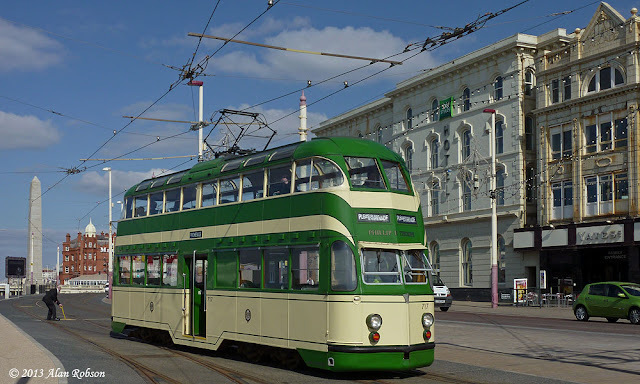 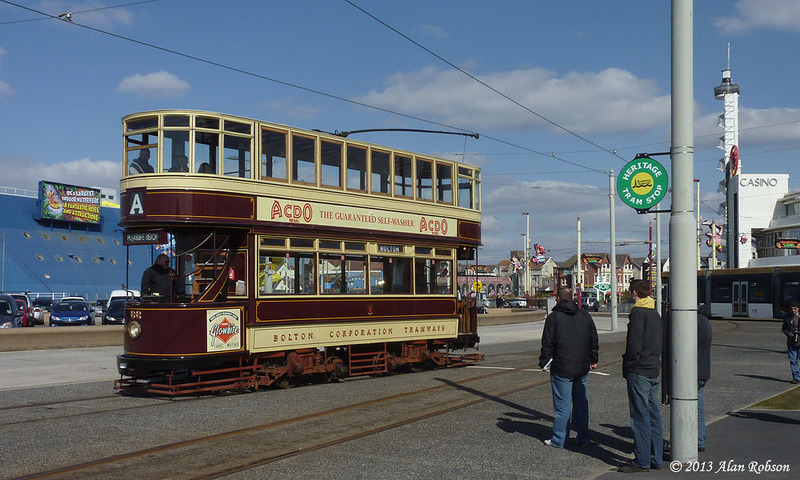 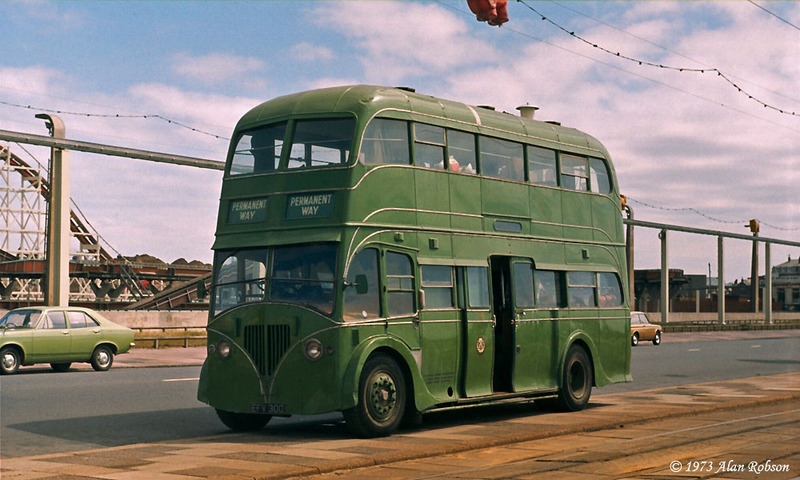 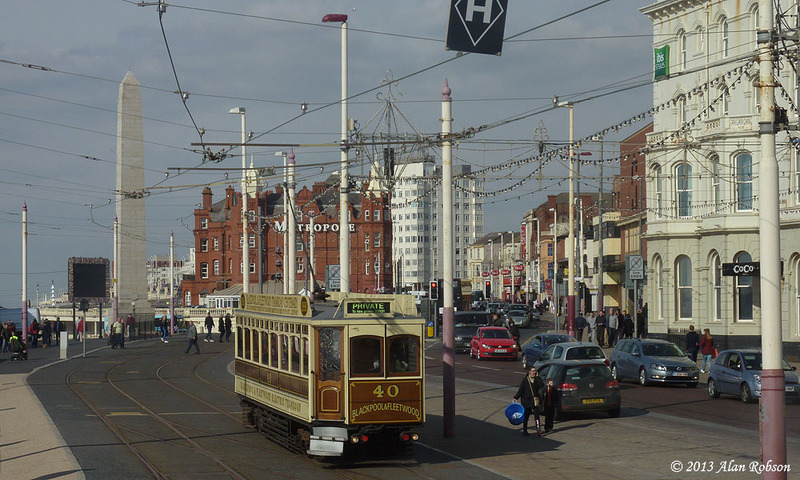 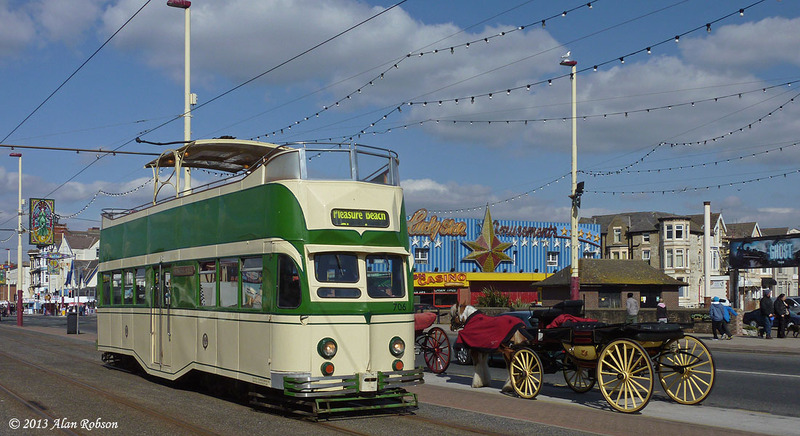 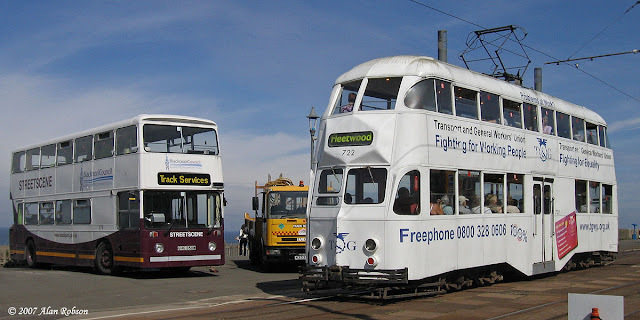 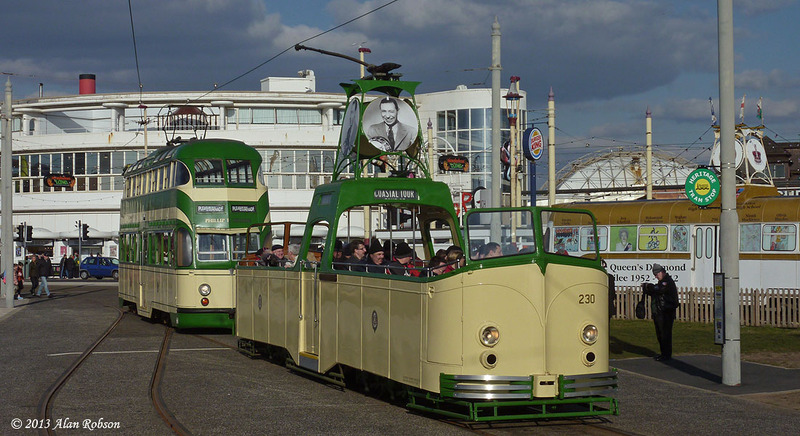 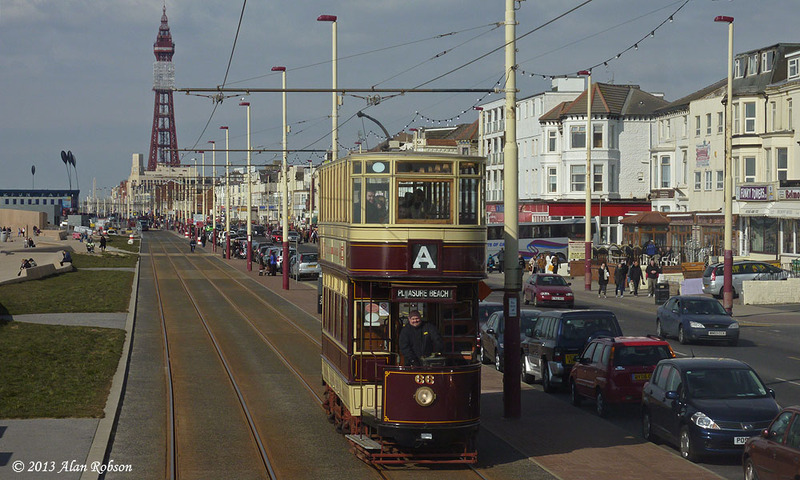 For more information on this years Heritage Tours, see Blackpool Transport's Heritage Tour website. 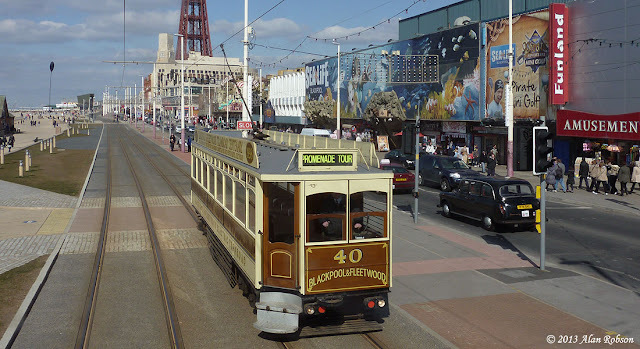 Blackpool Promenade is scheduled to be completely closed between Central Pier and North Pier due to roadworks from 18th to 28th March. 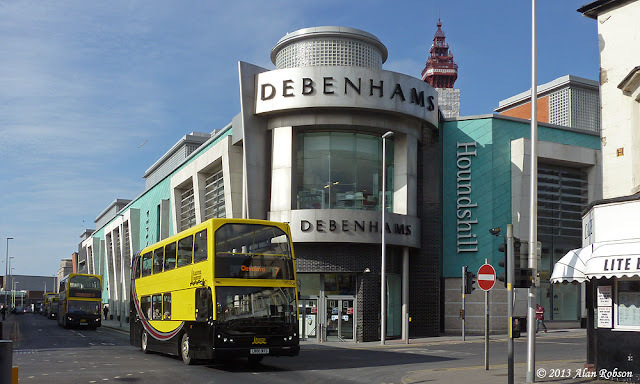 All bus routes that use this section of the promenade have had to be diverted inland. Note these roadworks do not affect the tram service. Northbound service 1 operates as normal to Central Pier, then turns right into Chapel Street, Central Drive, Albert Rd (with an additional stop outside Argos), Regent Rd, Cookson St, Talbot Rd, to the Promenade and then resumes its normal route. Northbound services along Central Drive continue on to Albert Rd (with an additional stop outside Argos), Regent Rd, Cookson St, Talbot Rd, Clifton St, Abingdon St, Talbot Rd then back on their normal routes again. 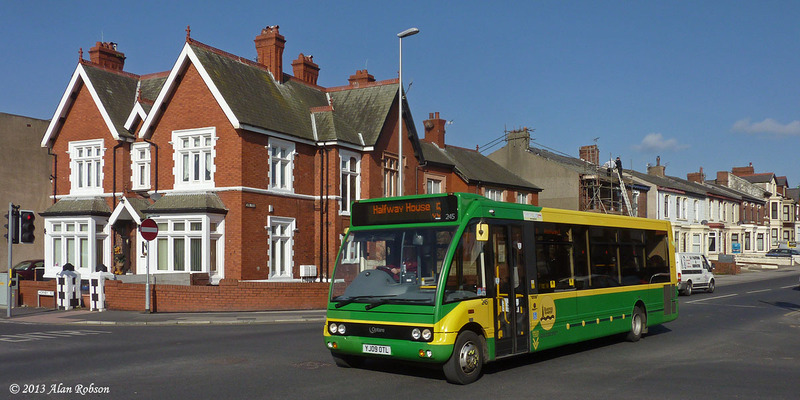 Southbound service 1 operates as normal to Talbot Square, then left onto Talbot Road, Dickson Road, Springfield Rd, New Larkhill St, Grosvenor St, Church St, Park Rd, Reads Ave, Central Drive, Bethesda Sq, Kay St, Chapel St and then turn left onto the Promenade and then resumes its normal route. 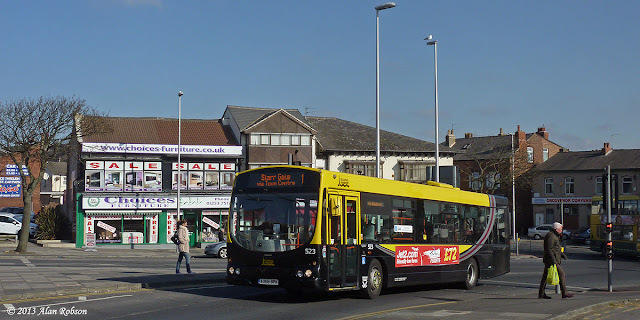 Southbound services follow their normal route to Market St, then via Church St, Corporation St, Talbot Rd, Dickson Rd, Springfield Rd, New Larkhill St, Grosvenor St, Church St, Park Road, Reads Ave, Central Drive then back on their normal routes again. 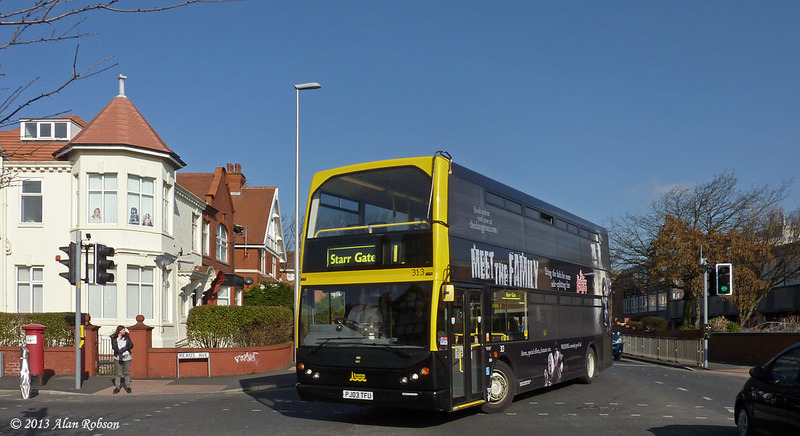 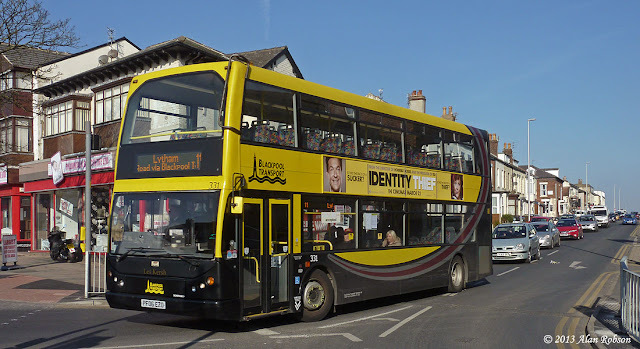 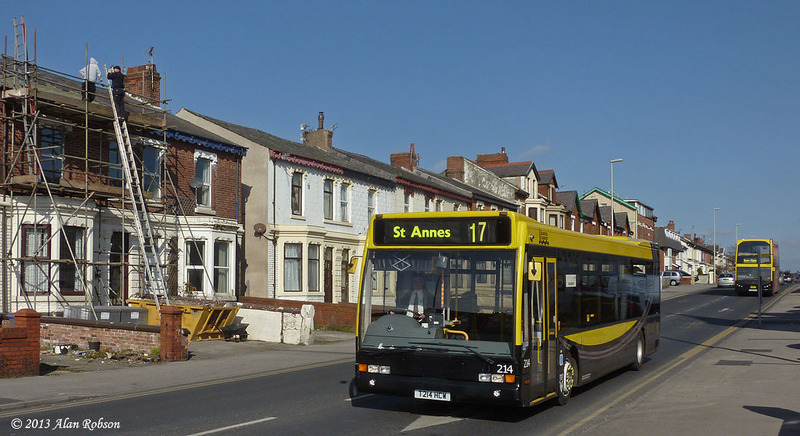 These route diversions also affect the Catch 22 service and Stagecoach services, which follow the same diversions that Blackpool Transport are using. After the speeches marking the re-entry into service of Stockport 5 at the Heaton Park Tramway Spring Gala on Sunday, it was officially announced that the process to rebuild Rawtenstall single-deck tram 23 is to begin. 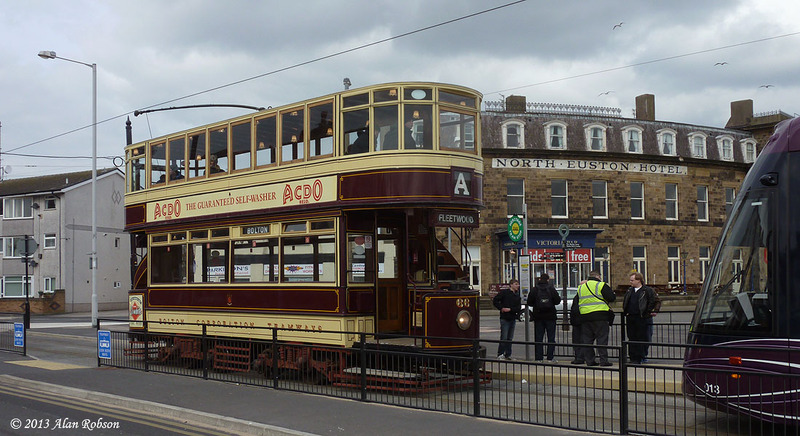 Rawtenstall 23 was built in 1912 by the United Electric Car Company in Preston, and after the tram was withdrawn in 1932 it was used locally as a garden shed for many years until being rescued for preservation. 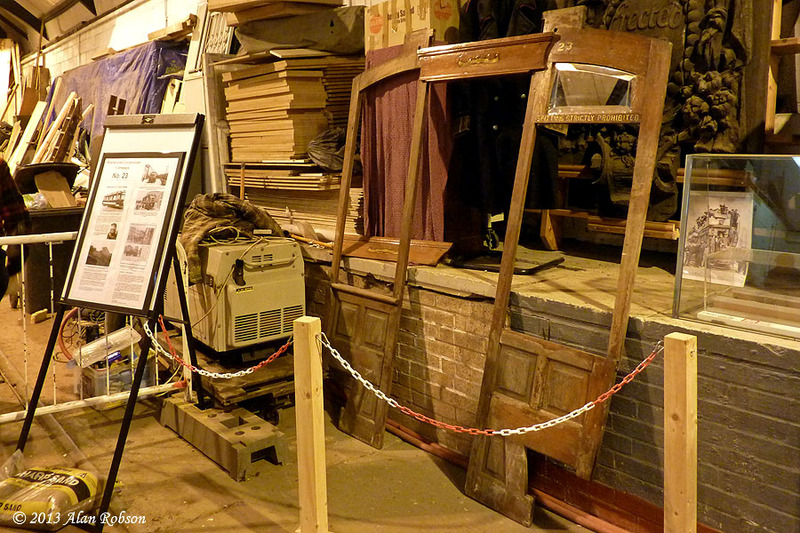 Sadly due to a lack of suitable accommodation it was decided to completely dismantled the tram body, and unfortunately some components appear to have been misplaced over the years. 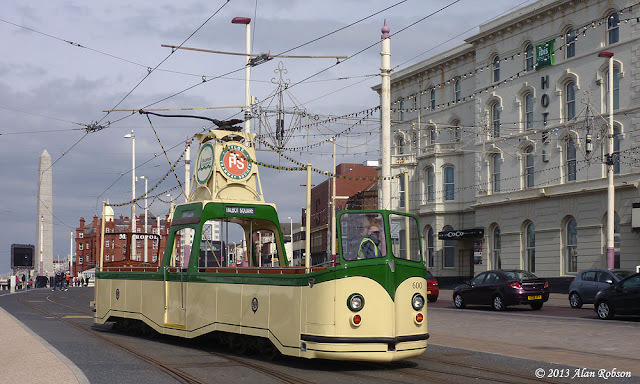 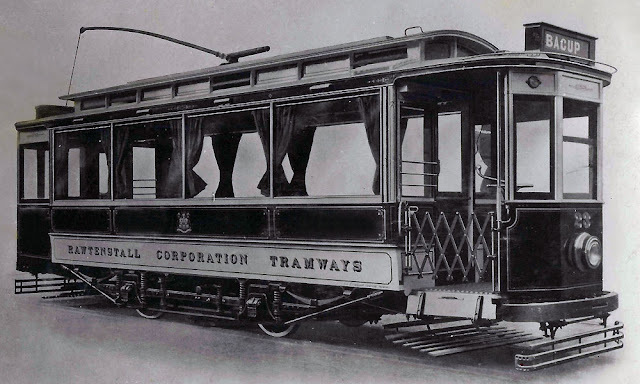 A suitable truck and electrical equipment have been acquired for the tram from various sources. Hopefully one day this tram may be rebuilt and enter passenger service alongside Manchester 765 and Stockport 5 in Heaton Park. 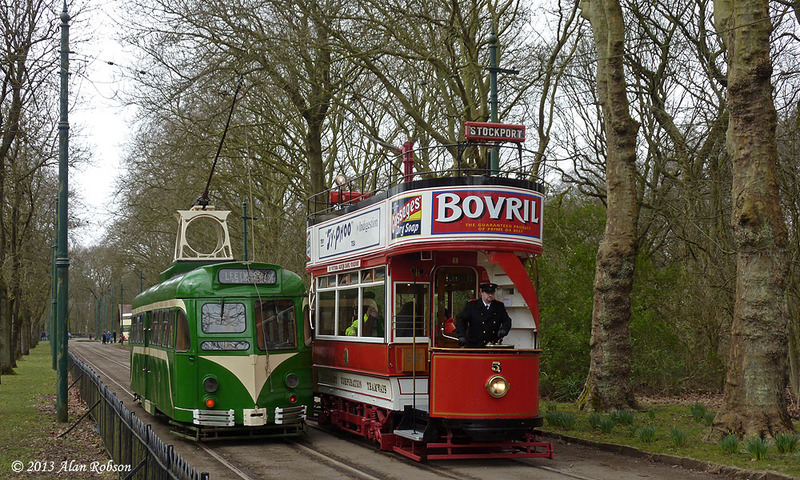 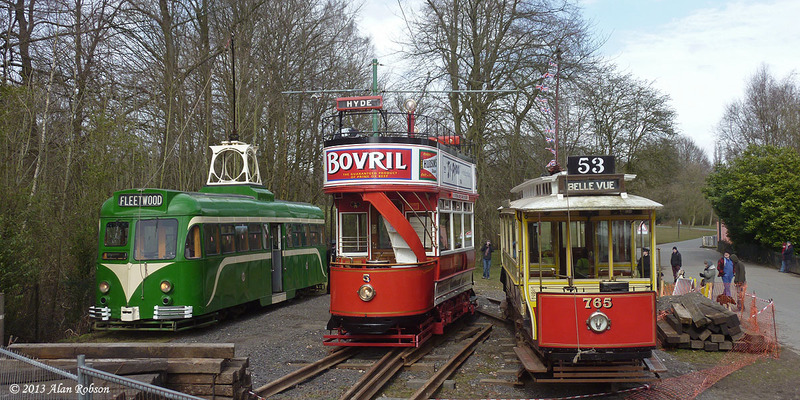 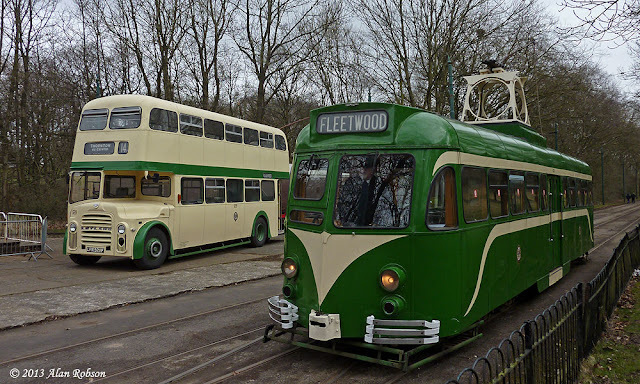 The Manchester Transport Museum Society held their Spring Gala at the Heaton Park Tramway on March 24th, three cars were operational, these being Blackpool 623, Stockport 5 and Manchester 765. 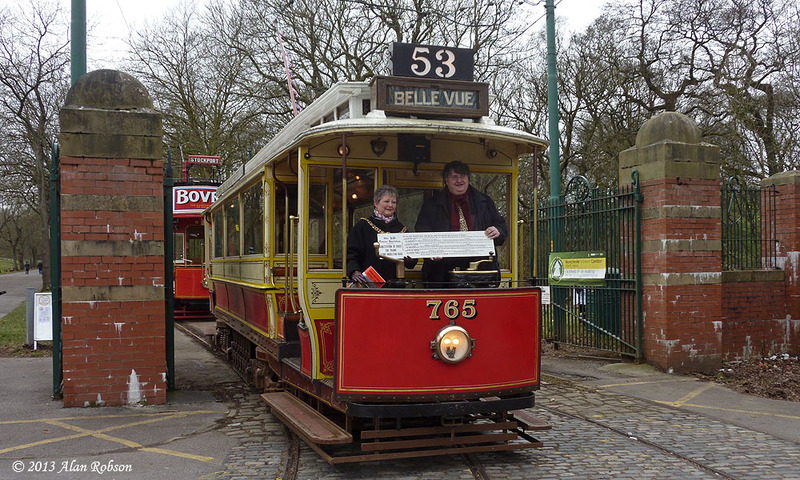 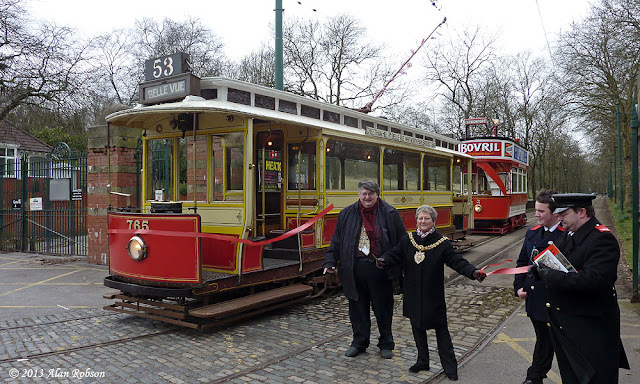 In the morning a small ceremony was held to mark the 80th anniversary since tramcars last ran down Middleton Road outside the park gates, the Lord Mayor of Manchester made a short speech and then cut a ceremonial ribbon. 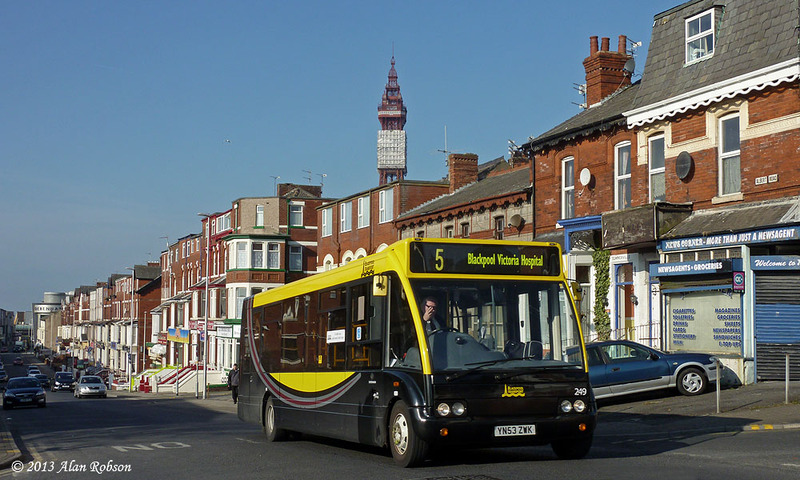 Stockport 5 was launched into service in the afternoon after a few speeches, complete with the full set of adverts that have been applied recently. 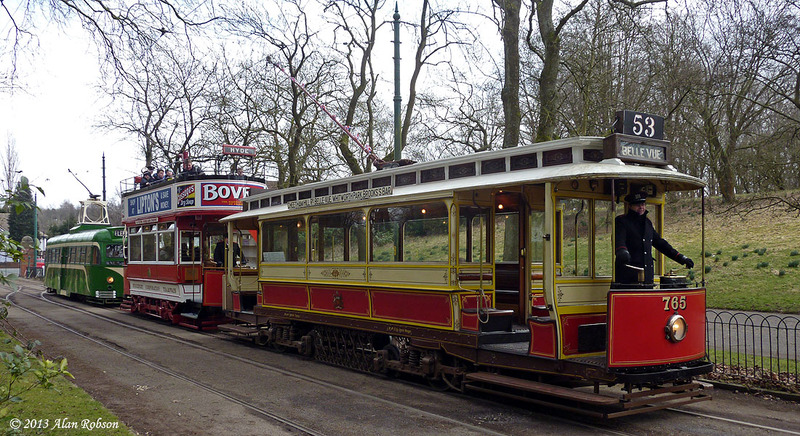 Stockport 5 had been due to visit the museum at Beamish this Spring, but unfortunately the move was cancelled due to logistical reasons. 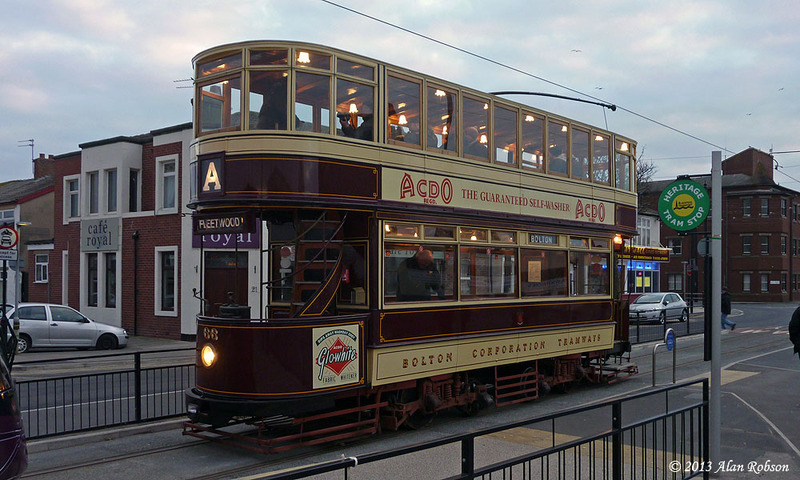 After Stockport 5 had been relaunched into service, the three operational trams formed a cavalcade near the Middleton Road gates, they then proceeded together to the Lakeside terminus. 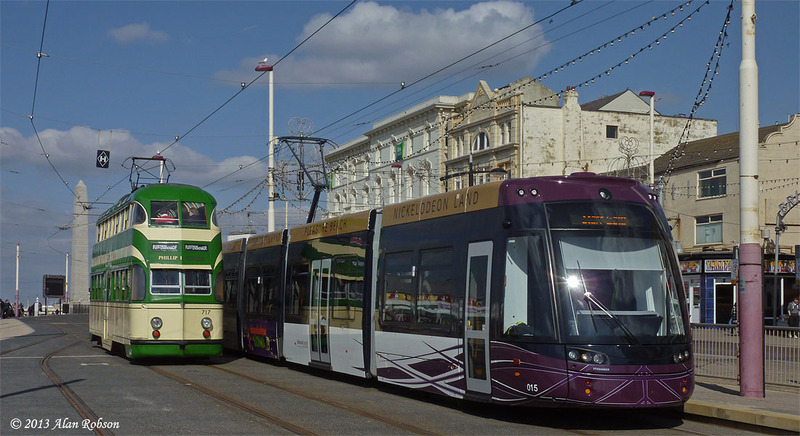 At Lakeside, 623, 5 & 765 were positioned line abreast on the three track layout there, the first time that three trams have been lined up side by side at this terminus. 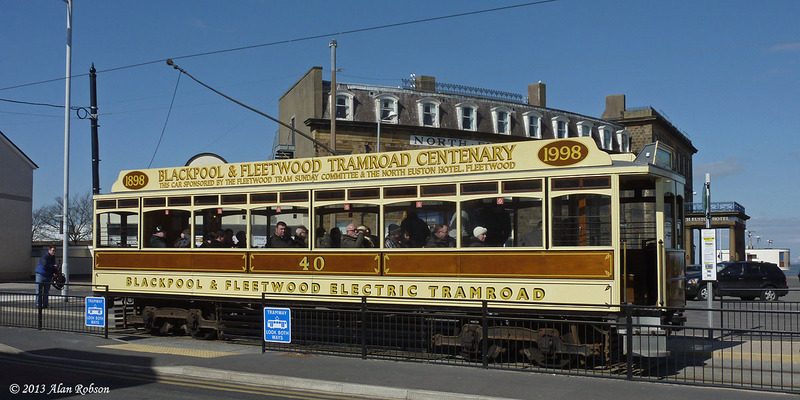 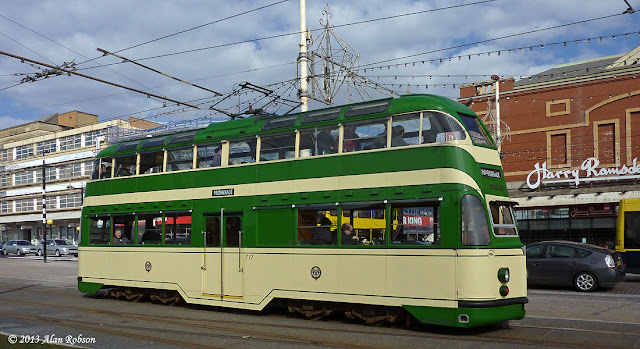 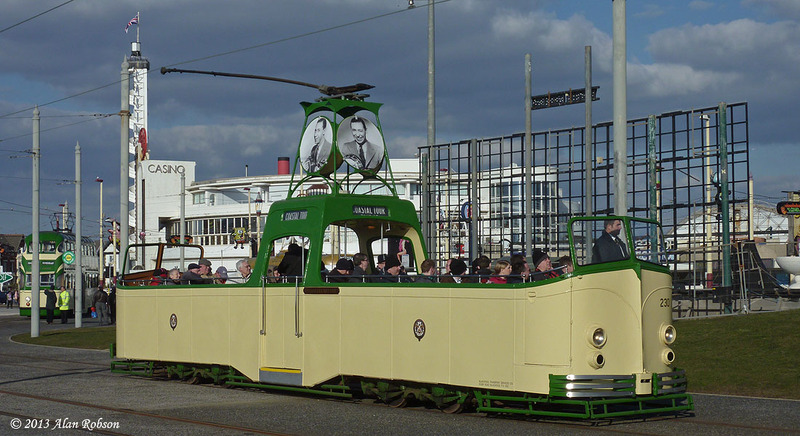 With the anticipated work by Blackpool Transport to restore Centenary 648 to an earlier guise, and the possibility of it returning into green and cream, the other extant Centenary cars on the Fylde coast have been rather overlooked. 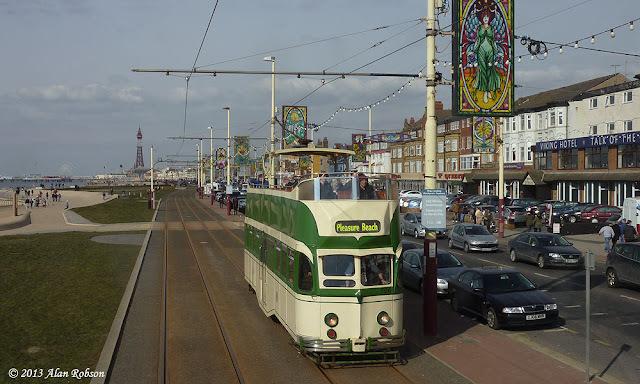 Blackpool's own heritage Centenary has been unexpectedly beaten into second place in the race to return green and cream by another of the local Centenarys. 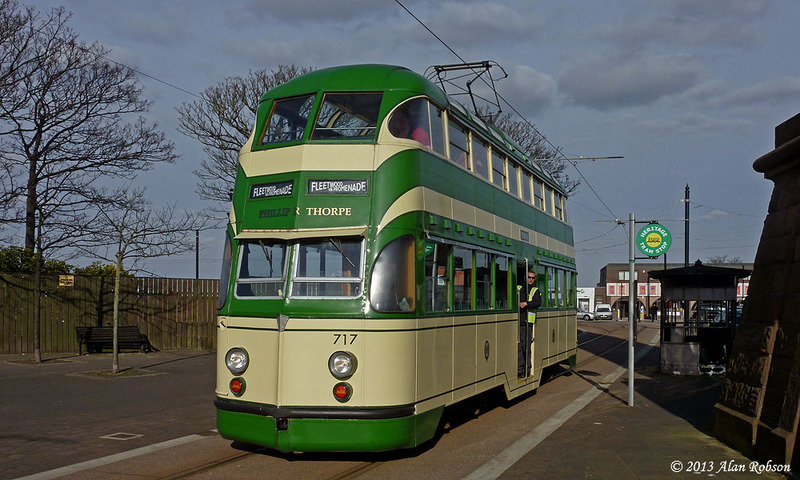 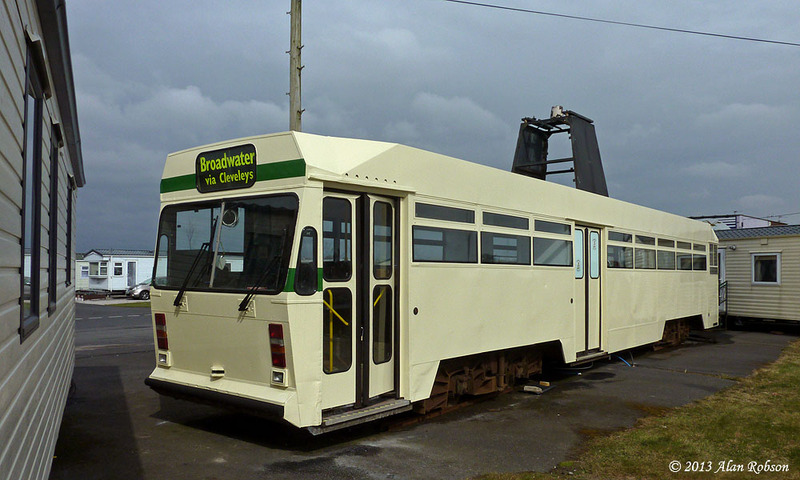 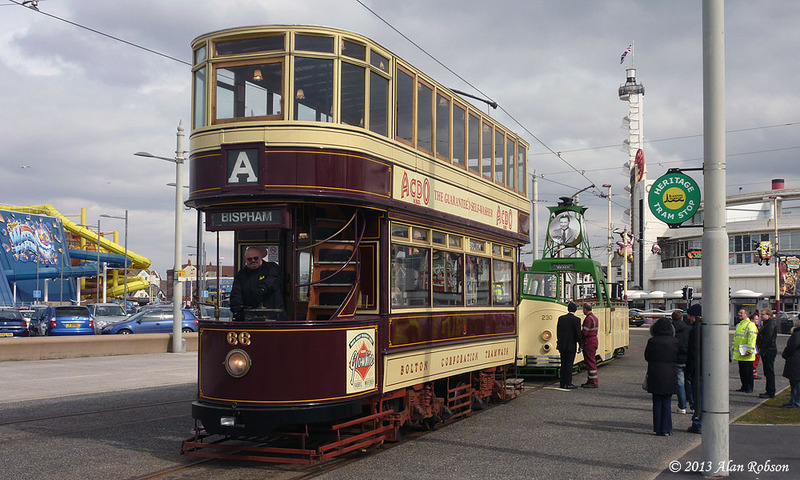 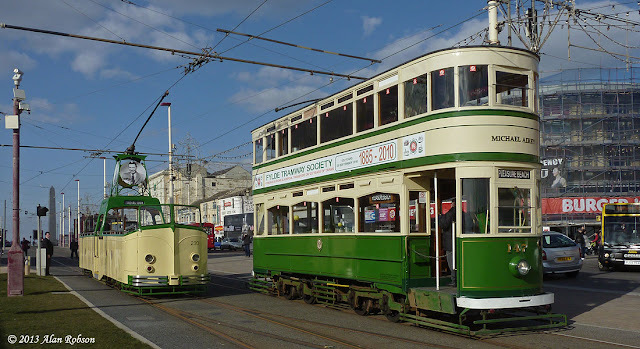 The previously black and white Centenary 643 at Broadwater Caravan Park in Fleetwood has been repainted, in a mostly cream colour scheme with two green bands along one side of the tram only and on both cab ends. The tram was delivered to the caravan park by Scotts Heavy Haulage in January of 2012, and has remained in its existing Metro Coastlines black and white colour scheme up until this new repaint. 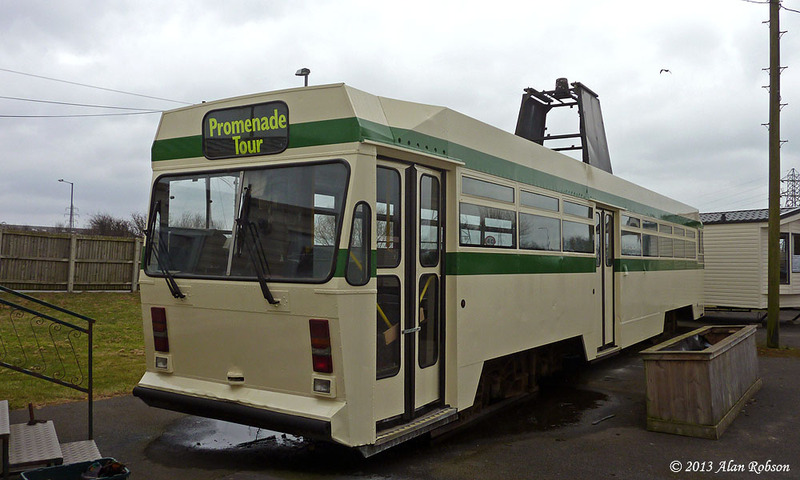 The recent work to the rail joints at Foxhall Square saw the track gang being accompanied by their new mobile mess room, Metrorider 1064. 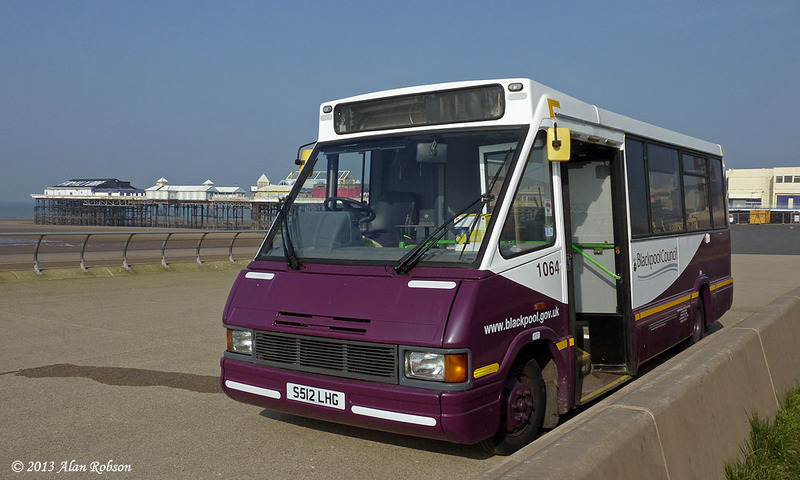 This bus has been converted from former Blackpool Transport 512 (S512 LHG), an Optare bodied Metrorider delivered new to the operator in 1978. 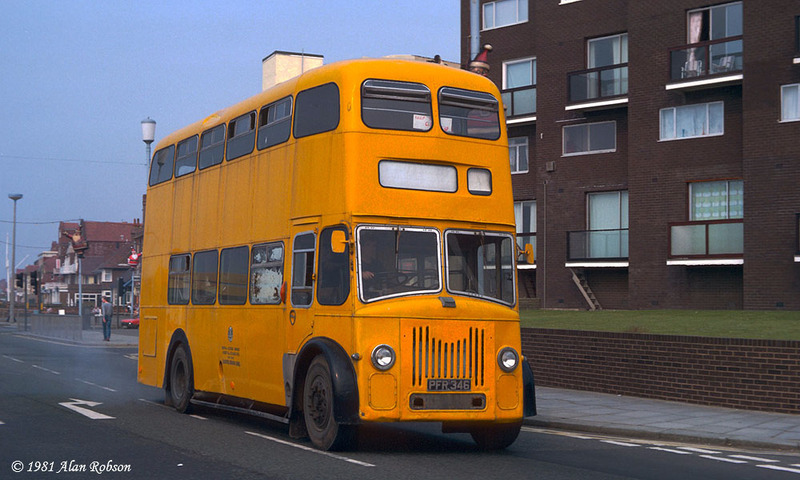 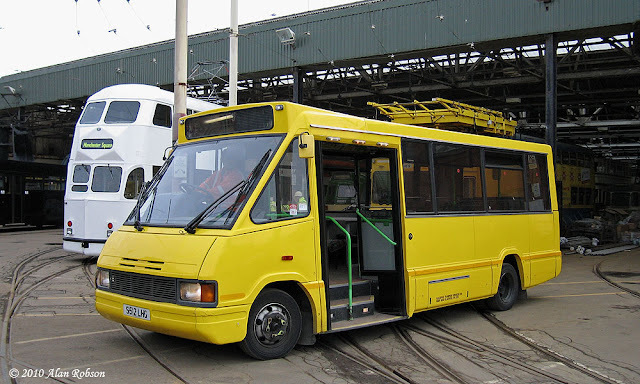 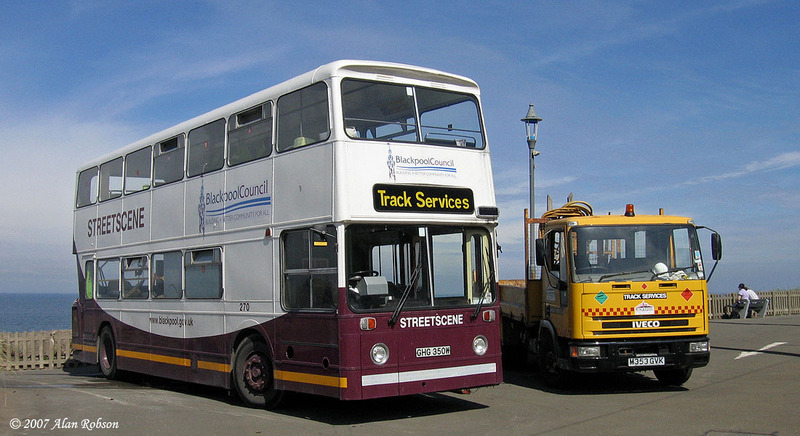 The vehicle is now painted in Blackpool Council colours and is used by their Track Services department as a mobile mess room, replacing Atlantean 270 which had been used for this purpose since 2006.